The problem is when I burn to Blu-Ray there is no sound at all. When I go in to the "Edit" mode in Toast Titanium and have the "english DTS" audio selected, there is no sound during playback within Toast's editor, BUT when I switch to "spanish...", I get the spanish track clear. Any idea what is going on or how to correct it? I do have a work around. Convert in Handbrake at the highest possible resolution, then use the resulting m4v to feed Toast and create the Blu-Ray. Not the way to go as it adds lots of artifacts from the various format changes. I’m suspecting Toast doesn’t support DTS audio (nor multiple audio streams, nor subtitles in the encoding/authoring process). A tool like ffmpeg (command line) can copy some streams as-is, but re-encode other specified streams, and ignore yet other streams. That might be more suitable in this case than HandBrake GUI, which can’t pass-through video, afaik. This Terminal command assumes a pre-installed ffmpeg binary. 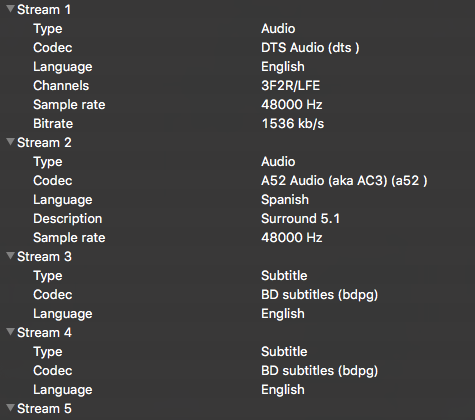 It will copy the video stream (with highest quality (resolution)), re-encode the audio stream with the highest quality (most channels) (or the first if there are several HQ streams) to AC-3 448 kbps, and ignore all other streams, and put the result into a new file. Yes, that worked and much, much faster!